A short time ago I pulled into Wendy’s for some nourishment — well ok…. I stopped to fill my belly, not sure if there is nourishment in this food or not! But man it was good. Today I am out doing some more home communions. 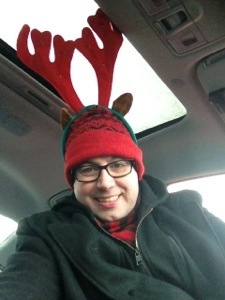 I have my antlers on for fun, and my car is playing all the Newfoundland Christmas Music known to humankind. (Special thank you here to my other brother Darryl and his wife Karen for the CD of Newfoundland Christmas favourites they gave me last year!) For some reason, the whole thing has me in the spirit or the mood of Christmas today. But even a priestly reindeer gets hungry. So I halted the sleigh and here I sit. But I have discovered that not everyone is in the spirit! I was standing in line and I could not get the tune of The Seven Joys of Mary by Great Big Sea out of my brain — so I was whistling it while I waited. Then a (heeheeem) gentleman arrives in line behind me and immediately declares – “That is VERY annoying sir – knock it off!” His spouse looked a little annoyed at that moment — but it was not with me. So I engaged him of course. “You know,” I said, “I can see how me whistling might be annoying – Sorry. I must confess though that you making that declaration upon just arriving in the line is also annoying.” He spouse quickly added, “I agree!” “Just enjoying the season sir,” I said. Then he said, “perhaps if you whistled something Christmasy it would be better.” “That was Christmasy – GBS from Newfoundland!” Well now I had his attention. “You are a Newfie – that explains it!” He said. “I work with a Newfie in Calgary. He is a hard worker when we can keep him outta the bars. -Boy can you guys drink!” There were too many stereotypes for me to take on all at once so I simply said … “I hope you Have a Merry Christmas,” as I let him go ahead of me as penance for annoying him. We both left pleasantly after an awkward meeting. Leaves me wondering what else we might all encounter in these next couple of days of madness. I am praying for patience to respond to impatience, or anger, or foolishness, with some charity, kindness and joy – there is not always an over abundance of those on hand on these last shopping days – but we sure do have to find them in ourselves. Good thing you we’re singing “Grandma got run over by a reindeer”.Merry Christmas from proud Newfie. I just spent the last 2 hours grocery shopping and Yes there are a lot of grumpy Grinchey Scroogey types out there today! I also stopped at Tim Horton’s – unfortunately there was no priestly reindeer in my line to make me laugh! I am sure all the folks who received home communion appreciated them. Kevin, I am sure you spread a lot of joy today, including others in your line! Merry Christmas to you and Catherinanne!!! You’re not annoying Kevin. You are en-deer-ing. And that’s what Christmas is all about Charlie Brown…. I am enjoying all the witty puns and comments above. I am embarrassed to say that, without reading your post, Kevin, I saw only a tiny pictture which did not reveal your antlers and thought itlooked like bunny ears. However, I do have cataracts…..You do a great job spreading good cheer and do keep it up.